The thing is, I’m perfectly happy with my current cleansing situation. I generally use an eye make-up remover/micellar-soaked cotton pad to remove most of the bulk of make-up, then massage in my Exuviance Cream Cleanser once, remove with a flannel steeped in warm water, and do it a second time for good measure. 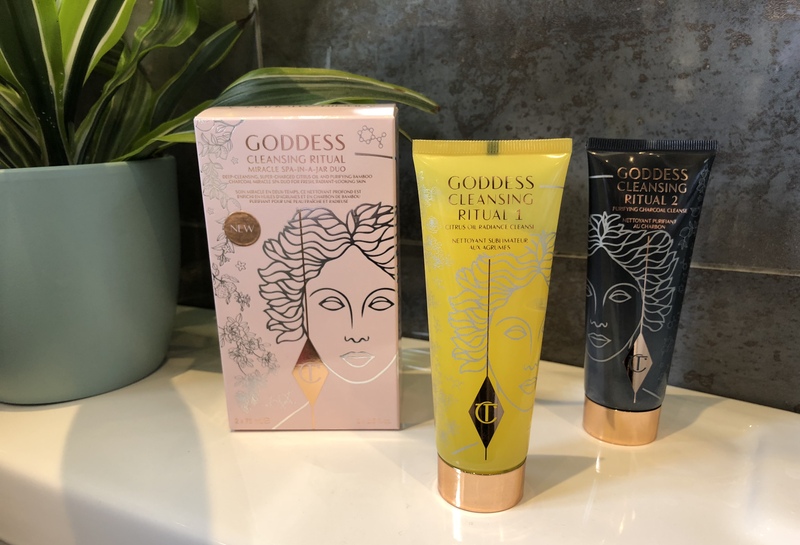 But ever the intrepid explorer of beauty, for the past week I have been trialling Charlotte Tilbury’s new Goddess Cleansing Ritual Miracle Spa-In-A-Jar Duo in the name of research and am impressed. Two things before I tell you about my experience. First, both steps in this cleansing routine might irritate sensitive skin as they’re active and contain essential oils. The duo also isn’t, in my view, suitable for nightly use. I would put this in the bracket of treatment cleanser owing to the second charcoal phase which tips this into cleanser/mask territory (though you could separate both stages and use the first oil cleanser nightly to remove make-up). Given that my skin is prone to congestion, doesn’t generally respond badly to essential oils, and could do with some brightening, I was the target audience for this, though, as I’ve said, I used it every other night which I felt was sufficient. 1) Ritual 1: Citrus Oil Radiance Cleanse. Basically, a oil-in-gel product that’s designed to melt make-up away. They give you a muslin in the pack to take it off with, but it felt puny compared to my usual flannel so I used that instead. This took off all my skin make-up in a single go, but I still had a little bit of residual stuff around my eyes so I’d recommend using an eye make-up remover first. 2) Ritual 2: Purifying Charcoal Cleanse. You apply this cream-to-foam to skin that’s still damp, massage it in, then remove with the muslin (flannel, in my case). Given that the purpose of this one is to purify, I was surprised to find it didn’t leave my skin feeling tight and uncomfortable. It didn’t foam as much as I expected, which is no bad thing, but wanted to flag that in case you buy and find yourself waiting for a lot of foam, as I did the first time round.